The great Protestant Reformation of the 16th century did not burst upon Europe as something entirely new and without prior preparation. The work of God through Luther and Calvin was built upon God's work in men who preceded them and paved the way. 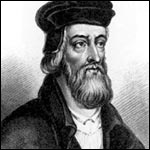 Two such men were John Wycliffe in England and John Hus in Bohemia. The peasant could not expect any preaching from the resident priest, but he would get it from the preaching friar, and from the travelling pardoner, with his wallet "bret full of pardons, come from Rome all hot." Besides these religious roundsmen there were others who would travel through the winding, muddy roads and green lanes of England: minstrels, tumblers, jugglers, beggars and charlatans of every kind, living off the poor peasants. The peasant knew something of the sayings of Christ and Bible stories, but they were so embellished by the friar's sensational and entertaining sermons that he would not know truth from error. He never saw a Bible in English, and if he could have seen one he would not have been able to read it. Nor were the times peaceful and quiet. They were unusually turbulent. During Wycliffe's short lifetime the black death struck Europe and England and carried away one third of the population. Also during his lifetime the Peasant's War left parts of England devastated and brought about major economic upheaval. In the church as well confusion and unrest reigned. It was the time when the papacy was not in Rome, the eternal city, but in Avignon under the control of the French. And, although during Wycliffe's days the so-called Babylonian Captivity of the Church came to an end, the end was the papal schism during which there were two popes, and sometimes three, bellowing away at each other like mad bulls and hurling back and forth anathemas and excommunications. Very little is known of Wycliffe's early life -- not even the date of his birth. Some argue for 1324; others for 1330. He was born near West Riding in Yorkshire in a small village called "Wycliffe," which would seem to indicate that his parents were lords of the manor in the area, wealthy and respectable. Little more is known of them, other than the possibility that they totally repudiated their son when he began to teach biblical ideas. At about 15 or 16 he went off to Oxford to study. The years of study were long and difficult: one who went through the entire program could not expect to complete his studies until 33 years of age under ordinary circumstances. Wycliffe spent much of his life in Oxford: he gained his BA in 1356, his BD in 1369, and his DD in 1372 -- although his studies were interrupted for two years by official business. Not even much is known about these years. He was probably in Merton College; was master of Balliol College from 1359-1360; and had some dealings with Christ's College. Oxford was composed at this time of six colleges. It had about 75 members, all of whom were of the clergy, and it served about 1,500 undergraduates. it was surrounded by priories and halls which were full of monks and friars who were a constant source of irritation to the members of the university. It was the best university in all of Europe, surpassing even the great universities of France. In 1361 Wycliffe became rector in the church of Fillingham, in Lincolnshire, which meant technically that he was its pastor, but which meant in fact (as was the custom in those days) that he received the income from that parish while he could continue his studies and work in Oxford. This did not mean that he totally neglected his parish, for he preached there from time to time; and it did make him an ordained minister in the Roman Catholic Church. In 1368 he was transferred to Lutterworth, a parish in which he spent the last years of his life. Oxford was, however, the seat of his labors. During his studies, and for years after he had completed them, he was a teacher at Oxford. Much of his reformatory work was done within those halls. He was always and pre-eminently a professor and not, in the first place, a preacher. The friars who lived on Oxford's premises, and who caused the university untold grief, were to become the first objects of Wycliffe's anger. He wrote a book, Objections to the Friars, which really sounded the trumpet blast of reform. But the crucial issues came up in Wycliffe's life in connection with political problems. And, as is so often true of the affairs of men and nations, the bottom line was money. The trouble was that much of England's wealth was flowing out of the country and to the papacy. While this had been more or less true from the time that England had come under Roman Catholic control, it was most emphatically true after King John delivered England to the pope as the pope's kingdom and had received it back as a papal fief more than 200 years earlier. This was humiliating and intolerable to good Englishmen. The charge levied by the pope was 1,000 marks a year -- an almost impossible burden. But money moved out of England in other ways: ecclesiastical offices were sold to the highest bidder, with the money going to the pope. Many offices in England were held by foreigners who never saw the land in which they held office. Some of those officers were nothing but children, but they reaped the income of the offices -- after the pope had been paid off. The pope often moved bishops from one see to another and received one year's salary as his part of the transaction. Much money for the forgiveness of sins was funneled out of England to the papal coffers. In fact the pope received five times more money than the king. To add insult to injury, the money was going to a French pope and eventually found its way into French hands; and France was at war with England. England was thus supporting its enemy in the wars. God hath given his sheep to the Pope to be pastored and not shorn and shaven . . . therefore it would be good to renew all the statutes against provisions from Rome . . . . No papal collector should remain in England upon pain of life and limb, and no Englishman, on the like pain, should become such collector or remain at the court of Rome. Into this issue Wycliffe was thrust. He not only became involved in the problem as a writer of pamphlets and treatises, but he also served on a committee of the king to meet in Bruges of the Netherlands with papal representatives to arbitrate, if possible, the issues. With patriotic zeal, he defended the rights of England against the papacy. It was in Bruges that two important things took place which were to have influence on Wycliffe's later life. The first was the fact that, in dealing with papal representatives, he learned that they were a treacherous and deceitful lot and that they represented a papacy which was wholly secular, covetous, immoral, corrupt, and a tool of French kings. He so completely lost his confidence in the papacy and hierarchy of the church that he had nothing but contempt and scorn for it from that day on. The second event of importance was that he met the Duke of Gaunt, who was in Bruges for other business, and who was probably the most powerful man in England after the king. The two became friends and it was due only to the friendship of the Duke of Gaunt that Wycliffe was not killed by the Romish Church. Wycliffe's defense of England's rights to keep its revenues within its own borders was courageous and bold. The deeper he entered into this defense, the more clearly he wrote against the corruptions of the Romish hierarchy. He was the first to call the pope Antichrist -- a name later echoed by the Westminster divines and incorporated into the Westminster Confession. He denied the pope supreme power in the church, denied the temporal rule of the pope in the nations, denied the power of the pope to forgive sins, and, in fact, denied that anyone but a godly pope had any authority whatsoever. An old chronicler speaks of Wycliffe as running about from place to place barking against the church. The pope, in Wycliffe's own words, was "the antichrist, the proud, worldly priest of Rome, and the most cursed of clippers and cut-purses." It is no wonder that the church did not take too kindly to all this. From the pope on down, notice was taken of Wycliffe, and the orders went out from the highest levels of ecclesiastical hierarchy to silence the blasphemer. The first effort made to silence him was a summons from the Archbishop of Canterbury to appear before this highest ecclesiastic in England for trial. It was an interesting meeting. The Duke of Gaunt was there with some of his soldiers, as well as a large number of people from the monied classes, many of whom supported Wycliffe. Before the Archbishop could get on with any kind of a trial, he got involved in a heated discussion with the Duke over the question whether Wycliffe should sit down -- the Archbishop insisting he ought to stand as a measure of respect; the Duke insisting he should sit down since the Archbishop did not really amount to that much. The whole meeting ended in a brawl and nothing could be done against Wycliffe. This was on February 19, 1377. In April of 1378 Wycliffe was once again summoned to the courts of the church, but this time to an assembly of bishops. The bishops were almost sure that this time they would succeed in sentencing Wycliffe to the stake and be rid, once and for all, of his critical writings and preaching which were such an embarrassment to the church. But this effort also proved unsuccessful, for not only did Wycliffe enjoy the favor of the people, but the queen mother sent word to the bishops that, although they could try Wycliffe as much as they pleased, they had better not condemn him, on peril of their lives. This so filled them with fear and consternation that they immediately disbanded the meeting. God used strange ways and strange people to protect His servant. But 1378 proved to be a turning point in Wycliffe's life. Shortly after the convocation of the bishops Wycliffe underwent what was almost a conversion. He was no longer interested in the politics of the realm, nor in helping promote the cause of the king and the landowners in their battle with the papacy. It seems as if, under God's leading through the Spirit of Christ, he began to see that the evils in the Romish Church were, after all, not primarily evils in practice, but evils rooted in the false doctrines which Rome had adopted over the years. And so he began to concentrate his labors on the investigation of Scripture and the development of the truths of Scripture. Through strange and remarkable ways, God had preserved him from the fury of the Romish Church and from almost certain death at her hands for yet greater things. It may be also that another incident in his life was used by God to bring about this conversion. About this same time, Wycliffe became desperately ill, ill unto death. The friars and monks were sure he was going to die; and so they sent a delegation to him under a hypocritical pretense of seeking his spiritual welfare -- while nothing would have delighted them more than that he die. They attempted to force him to recant all he had written and to make peace with the church. Though desperately ill, in sheer exasperation Wycliffe finally managed, with some help from a servant, to raise himself upon the bed. Glaring at the assorted friars and monks gathered about him, he assured them not only that he was going to recover from his illness, but that the Lord would spare him to do yet more harm to their evil cause. With these words he drove them from the room. God did spare him. And God did spare him for yet greater things. To turn his attention to doctrinal matters was no easy thing for Wycliffe to do, for there was a large price to pay for it. Because he refused to involve himself any longer in the affairs of the realm and in the battle to keep England's wealth from flowing into papal coffers, those who were only interested in this aspect of the controversy with Rome lost interest in Wycliffe. First he lost the popularity of the people. Then the Duke of Gaunt was no longer interested in protecting him. And, finally, even his colleagues in Oxford refused to rise to his defense. In 1381 the Peasants' Uprising occupied the attention of the nation, and very little effort was made to silence Wycliffe. But on May 17, 1382 a council of bishops met in London under the prodding of the pope to consider what to do with the pestilential teachings of John Wycliffe. Just as the council was beginning its meeting a rare and unusual earthquake struck London, causing many walls to collapse and stones from buildings to rain down on the streets. Wycliffe interpreted this to mean that the judgment of God was upon the council met together to condemn him; but the archbishop assured the assembly that they should continue with their deliberations because the earthquake was proof that the awful teaching of Wycliffe had seeped into the ground and that now the earth had belched to rid itself of these foul doctrines. This council was, from that time on, known as the Earthquake Council. The council succeeded in condemning Wycliffe, but did not dare to execute him. It prevailed upon Oxford to expel him, which also Oxford did, though reluctantly. And so John Wycliffe retired to his parish in Lutterworth where he spent the rest of his days preaching, teaching, and developing his theology. It is really quite amazing how clearly John Wycliffe saw the truth almost 200 years before the Reformation. One great advantage which he had was access to a Bible in Oxford which, more and more with the passing of the years, attracted his attention and study. Another great advantage was two excellent teachers in his early years of study. After the sin of Lucifer there is none more opposed to the gospel than that which ruins souls by giving them a faithless minister. Bad pastors are the cause of unbelief, heresy and disorder. Another excellent teacher which Wycliffe was given was Thomas Bradwardine who, because of his brilliance, was called "Doctor Profundus" (the profound doctor). While able in philosophy and mathematics, he was above all a student of the Scriptures. It was Bradwardine who led Wycliffe to know the truth of the absolute sovereignty of God in grace over against all the Pelegianism in the Romish church. Bradwardine taught his students that the grace of God as determinative in salvation, and he opposed fiercely the doctrine of the free will of man. In fact, he taught these doctrines as they applied also to election and predestination. As Wycliffe developed his theology, he saw clearly many truths which were not to become fully the possession of the church until the days of Luther and Calvin. Some of the more important ones are worthwhile to list. Wycliffe was the first in centuries to teach the absolute authority of the Scriptures, over against the Romish error of the authority of the church. Wycliffe did battle too with Rome's doctrine that the church was the Romish hierarchy and institute. He taught instead (in a major breakthrough) that the church was the body of Christ and was composed only of the elect. It was in this connection that he also taught the truths of sovereign election and reprobation. Wycliffe opposed the doctrine of transubstantiation (something which particularly aroused the fury of Rome). He taught a spiritual presence of Christ in the sacrament of the Lord's Supper -- although he was not very clear on what this meant. He repudiated the practices of Rome such as indulgences, the merit of pilgrimages, penance, etc. He denied that the church had the power to forgive sins and insisted that forgiveness came only from Christ. These were doctrines which, almost 200 years later, because the central teachings of the Reformation. Wycliffe also put his teachings into practice. Beginning at Oxford, but continuing especially after he left Oxford for Lutterworth, Wycliffe began a translation of Scripture which he completed before his death. Although he did not know Scripture in its original languages, and translated Scripture from the Latin Vulgate, he gave a remarkably accurate translation which enabled the common people to hear the Scriptures in their language for the first time. We include here a few verses of his translation of Genesis 1 -- in the old English which he used. In the firste made God of nougt heuene and erthe. The erthe forsothe was veyn with ynee and void, and derknessis weren vpon the face of the see; and the Spiryt of God was born vpon the watrys. And God seide, Be maad ligt; and maad is ligt. 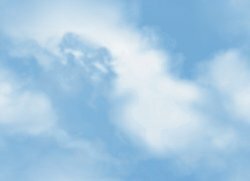 And God sawg ligt, that it was good, and deuydid [divided] ligt fro derknessis; an clepide [called] ligt day and derknessis, nygt. And maad is euen and moru [morn], o day. Seide forsothe God, Be maad a firmament in the myddel of watres, and dyuyde it watres from watrys. It is difficult for us to imagine how these simple and familiar words must have thrilled the hearts of thousands when they heard them for the first time. The translating of the Scriptures was also extremely dangerous, because the church had forbidden that the Scriptures be put into the language of the common people. Nevertheless, even though printing had not been invented, many copies must have been made laboriously by hand, for there are still nearly 170 hand-copied Wycliffe Bibles extant. Wycliffe believed strongly in the importance of preaching, something almost unheard of in his times in the decay of the Romish Church. He not only preached in his parish, but already in Oxford he began to train preachers to go out among the people with the gospel. He continued this while in Lutterworth and, arming them with a copy of Scripture or a part of it, taught them to expound the Word of God to the people. These traveling preachers became known as Lollards. While they were severely persecuted, they continued after Wycliffe's death and preserved his teachings until the Reformation finally broke upon England in the mid-1500s. Although Wycliffe suffered a stroke when about 50 years old, he partially recovered from it and continued his writing, preaching, teaching, and the training of his beloved Lollards. Finally, because the prelates in England seemed unable to do anything about Wycliffe, the pope himself summoned Wycliffe to Rome for trial. But Wycliffe had suffered his stroke and wrote a letter of decline. He suffered two more strokes, the last one in the pulpit, and finally left this life on December 31, 1384. Wyclif was spare, and probably never of robust health, but he was not an ascetic. He was fond of a good meal. In temper he was quick, in mind clear, in moral character unblemished. Towards his enemies he was sharp, but never coarse or ribald. William Thorpe, a young contemporary standing in the court of Archbishop Arundel, bore testimony that "he was emaciated in body and well-nigh destitute of strength, and in conduct most innocent. Very many of the chief men in England conferred with him, loved him dearly, wrote down his sayings and followed his manner of life." Chaucer wrote his famous "Canterbury Tales" about this time and included a section about Wycliffe. It is all the more forcible because Chaucer, a good Roman Catholic, had some biting words to say about friars and monks. We include this again in Old English. But riche he was of holy thoght and werk. Upon his feet, and in his hand a staf. Out of the gospel he those wordes caughte [took]. John Wycliffe was a great man of God. In the all-wise providence of God the Reformation of the 16th century would have been impossible without his work. He is the morning star indeed. So hated was he by Rome that, although Rome was restrained in his lifetime from harming him, the church could not let his bones rest in peace. On October 8, 1427, on order of the Council of Constance (the same Council that burned John Hus at the stake), Wycliffe's body was exhumed, his bones burned, and the ashes strewn on the River Swift. A later chronicler described this event in eloquent words. They burnt his bones to ashes and cast them into the Swift, a neighboring brook running hard by. Thus the brook conveyed his ashes into the Avon, the Avon into the Severn, the Severn into the narrow seas and they into the main ocean. And so the ashes of Wyclif are symbolic of his doctrine, which is now spread throughout the world.